London: For A. Milar, and A. Kincaid and J. Bell , 1759. Rare first edition of Adam Smith’s first book, with a recorded “print run of 1,000 copies” (Sher, “Editions of Adam’s Smith’s Books,” 13). Octavo, bound in full contemporary leather. In near fine condition. First editions are rare. 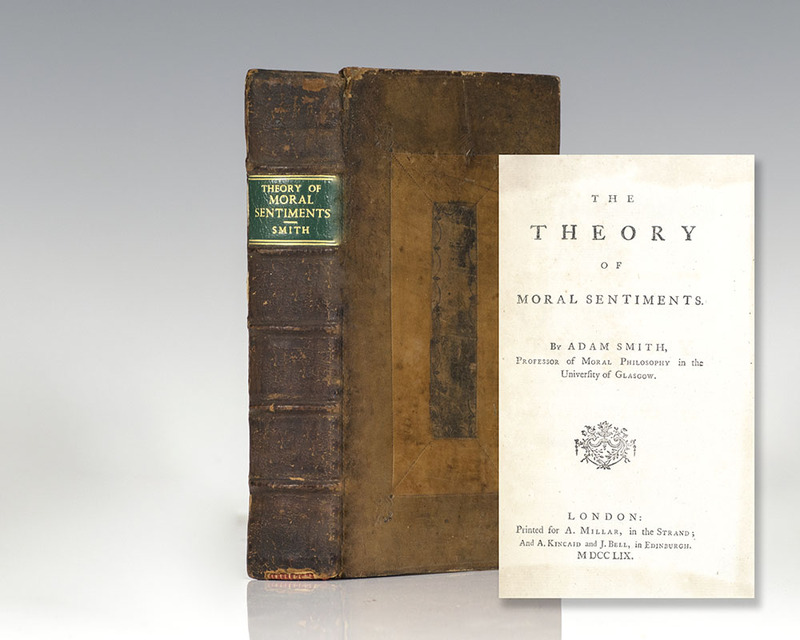 Adam Smith's Theory of Moral Sentiments, his first book, is "one of the truly outstanding books in the intellectual history of the world" (Amartya Sen). 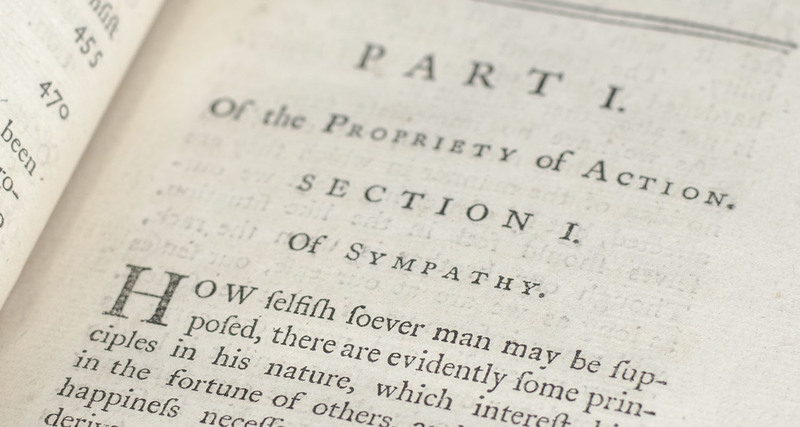 First published in 1759, it laid the foundation for Wealth of Nations and proposed the theory repeated in the later work: that self-seeking men are often "led by an invisible hand… without knowing it, without intending it, to advance the interest of the society." "The fruit of his Glasgow years… Moral Sentiments would be enough to assure the author a respected place among Scottish moral philosophers, and Smith himself ranked it above the Wealth of Nations… Its central idea is the concept, closely related to conscience, of the impartial spectator who helps man to distinguish right from wrong. For the same purpose, Immanuel Kant invented the categorical imperative and Sigmund Freud the superego" (Niehans, 62). 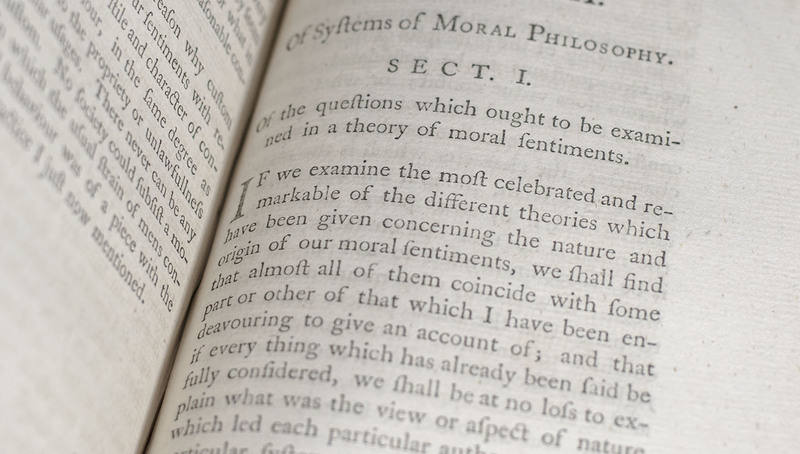 Basing moral sentiment on "the power one man has of putting himself in the place of another," in contrast to Hume's idea of self-interest, "Smith was henceforth recognized as one of the first authors of the day" (DNB). With Moral Sentiments and Wealth of Nations Smith created "not merely a treatise on moral philosophy and a treatise on economics, but a complete moral and political philosophy, in which the two elements of history and theory were to be closely conjoined" (Palgrave III:412-13). To Smith, when man pursues "his own private interests, the original and selfish sentiments of Moral Sentiments, he will, in the economic realm, choose those endeavors which will best serve society. Herein lies the connection between the two great works which make them the work of a single and largely consistent theorist" (Paul, "Adam Smith," 293). 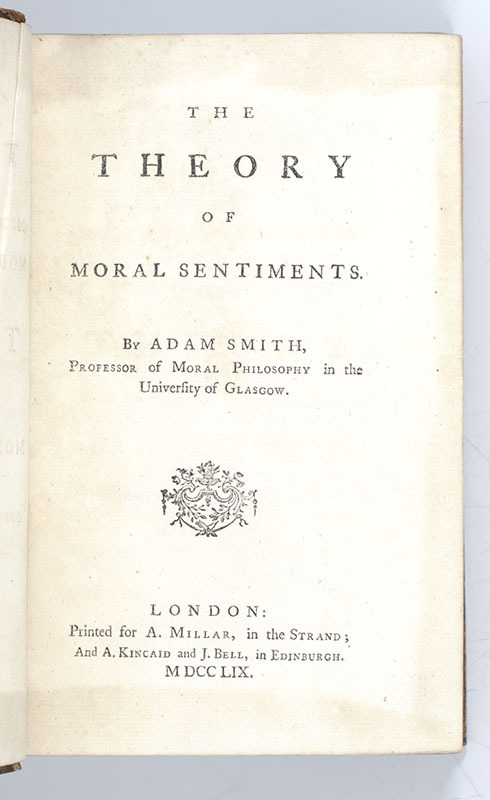 In his Theory of Moral Sentiments, Smith develops an ethics based on a “unifying principle—in this case, of sympathy—which would shed light on the harmonious and beneficial order of the moral world. As such it was of considerable interest to Smith’s contemporaries who were groping for an ethics that would flow from man’s impulses or sentiments rather than from his reason, from ‘innate ideas,’ or from theological precepts. If Smith had written only The Theory of Moral Sentiments, he would enjoy in the philosophers hall of fame a niche not unlike that reserved for Shaftesbury or Hutcheson.” Both Moral Sentiments and Wealth of Nations reflect Smith’s “attempt to anchor the new science of political economy in a Newtonian universe, mechanical albeit harmonious and beneficial, in which society is shown to benefit from the unintended consequences of the pursuit of individual self-interest. There is thus a considerable affinity between the structure of The Theory of Moral Sentiments and that of The Wealth of Nations. Each work is integrated by a great unifying principle. What sympathy accomplishes in the moral world, self-interest does in the economic one. Either principle, in its respective realm, is shown to produce a harmony such as the one that characterizes Newton’s order of nature… Smith’s ethics is one of self-command or self-reliance, just as is his laissez faire economics…. Smith’s ethics and his economics are integrated by the same principle of self-command, or self-reliance, which manifests itself in economics in laissez faire” (Spiegel, Growth of Economic Thought, 229-231).